The waters of Clew Bay, on the southern shore of the Currane Peninsula, and the Atlantic waters of Achill Island provide some of the best sea angling in Europe. A total of 34 species of sealife have been caught in Achill waters including the Irish records for porbeagle shark (365lb, in 1932) and blue shark (206lb, in 1959). 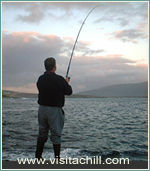 Shore angling is available in a number of spots on Achill, both beach fishing and rock fishing. A number of fishing boats also operate from harbours at Cloughmore and Purteen. Mackeral (for bait) may be obtained from local boatmen during the season. Keem Bay has a long association with angling and was at the centre of the shark fishing industry during the 1950s and 60s. Today it offers beach fishing for turbot, dab, flounder, plaice, dogfish and occasional sole. Distance casting produces ray and codling. Other common species available from beach and rock fishing on Achill include coalfish, pollack, wrasse, conger, bull huss, mullet and, occasionally, sea trout and bass. Notable captures include a 17lb coalfish, a 6.2lb tub gunard, and a 12.3lb pollack. Freshwater fishing is available at a number of lakes on Achill including Keel lake and Lough Gall and Lough na Mbreac in The Valley. Permits are required for lake fishing and these can be obtained from the Achill Tourism office.